Cyclaneusma needle cast (CNC) is a pine disease caused by the ascomycetous fungus Cyclaneusma minus (Butin) DiCosmo, Peredo and Minter. The pathogen occurs worldwide but is of particular significance in New Zealand where it infects Pinus radiata D. Don plantations. There are two morphological types of C. minus, termed C. minus ‘simile’ and C. minus ‘verum’, recently shown by multigene phylogenetic analysis to belong to distinct clades and therefore proposed to be two separate species. It is currently unknown whether one or both of these molecular operational taxonomic units (MOTUs) are responsible for CNC. In this study, DNA analysis of the rDNA internal transcribed spacer (ITS) region was carried out on 120 isolates of C. minus collected in New Zealand since 1969 to distinguish C. minus simile from C. minus verum. Specific primers for C. minus simile and C. minus verum were developed for molecular differentiation from pure cultures and direct amplification from infected needles. Using these specific primers, the distribution of C. minus simile and verum was determined from isolates collected throughout New Zealand. The C. minus simile and C. minus verum primers developed were specific to these morphotypes only and were successfully used to identify simile and verum MOTUs from culture. Morphological typing of cultures was consistent with specific primer results in only 56% of isolates tested, demonstrating the high level of skill and experience required for accurate morphotyping from culture alone. C. minus simile was more common throughout New Zealand including regions where CNC is known to be more prevalent. From a collection of 120 isolates, 89% of North Island isolates and 59% of the South Island isolates were C. minus simile. The C. minus simile and verum specific primers were used to detect Cyclaneusma DNA in symptomatic P. radiata needles. C. minus simile was detected in 39% of the needle samples and C. minus verum was only detected in 11%. However, Cyclaneusma DNA was not detected by PCR in 50% of the sampled needles. The molecular methods developed for differentiation of C. minus simile and C. minus verum can be used to rapidly identify these morphotypes from cultures or from infected needles, which reduces the time otherwise required for morphological identification. 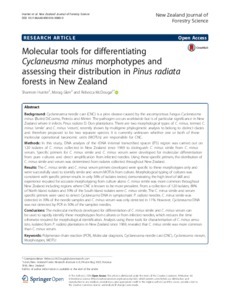 Analysis using these tools for characterisation of C. minus sensu lato, isolated from P. radiata plantations in New Zealand since 1969, revealed that C. minus simile was more common than C. minus verum.